Whiskers are extensions of the skin and not special hairs. 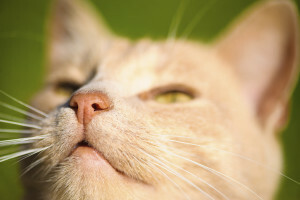 Each whisker is an intricate receptor designed to detect even the most minute changes in the environment: tiny movements, air currents, changes in air pressure, temperature, or wind direction. They help the cat to navigate at night, acting as radar. They are double the thickness of the cat’s guard hairs and are embedded three times as deeply in the skin in order to translate the slightest contact to sensory cells at their roots. They stimulate an eye blink when touched which helps to protect the eyes. The cat can change the position of its whiskers when hunting. They reach forward to give information about the prey in the cat’s mouth. The whiskers are located across the muzzle (12 on each side in 4 rows), high on the outer edges of the cheeks, above the eyes, and on the back of the front legs (carpal hairs).